Description: This is a collection of 1,000 freeware games, documents, and utilities, all gaming related. 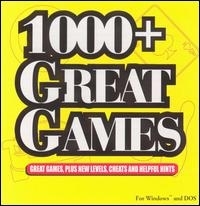 The cover of the case says "1000 Games & More", while the disc itself says "1000+ Great Games". This is a list of VGCollect users who have 1000+ Great Games in their Collection. This is a list of VGCollect users who have 1000+ Great Games in their Sell List. This is a list of VGCollect users who have 1000+ Great Games in their Wish List.